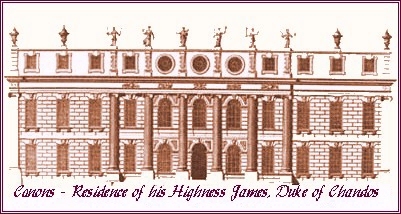 The rise and fall of HENRY JAMES BRYDGES, first duke of Chandos, provides as worthy a subject as any for a film or television drama. Within the space of ten years, from say 1710 to 1720, he rose to fame and riches, only to descend into relative obscurity following the loss of his wealth which was equally as dramatic as the gaining of it. Along the way he created one of baroque London's most palatial mansions, and was responsible for bequeathing to posterity the inestimable gift of Handel's Chandos Anthems. Born in 1673 the son of a Herefordshire squire, in 1696 he married his cousin, Mary Lake (c.1666-1712), who brought to the marriage the manor known as Canons as part of her dowry. Two years after his marriage to Mary Lake, Brydges became Member of Parliament for Hereford. He rose by force of personality, administrative ability and the favour of the Duke of Marlborough to become Paymaster of the Forces Abroad during the War of the Spanish Succession. The Paymaster was able to speculate with the monies he received, and by the time he left the post in 1713 Brydges had accumulated a fortune estimated at �0,000, a sum having in the year 1713 the same purchasing power as � million, or $95 million today. His first wife, Mary died in 1712, and in 1713 Brydges married his 43 year-old first cousin, Cassandra Willoughby (1670-1735). 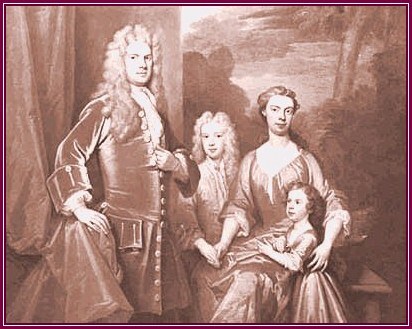 Kneller's family portrait, which is signed and dated 1713, shows Brydges with his second wife, Cassandra. At about this time he began the enlargement of Canons, remodeling the Jacobean mansion in the Georgian Baroque style. In 1714 the couple and Brydges' two sons (the only surviving children from nine born to him and Mary) moved into the first completed part of their enlarged and now palatial home. In October 1714 Brydges inherited the earldom of Caernarvon, which had recently been bestowed on his ailing father. 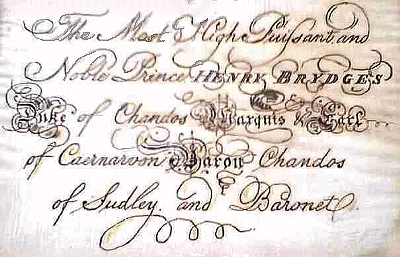 In 1717 Brydges was created first Duke of Chandos 'for no apparent reason', and in the same year on August 4th, he secured the services of Handel who joined the Chapelmaster Dr. Pepusch as composer-in-residence. The Duke maintained an excellent musical establishment of up to thirty first-class players among whom were named Francesco Scarlatti, brother of Alessandro, and Johann Christoph Bach, cousin of J.S. The Church of St. Lawrence on the Canons Estate had been almost entirely rebuilt in 1715 by Brydges. Only the tower of the original medieval church remained. A lavish patron of the arts, Brydges employed the fashionable artists of his day to decorate his great mansion of Canons, and those same artists - Antonio Bellucci, Louis Laguerre, Francesco Sleter - created the dramatic interior of the church. Walls and ceiling were covered with paintings of biblical scenes, some brilliantly coloured, others in sepia and grisaille. 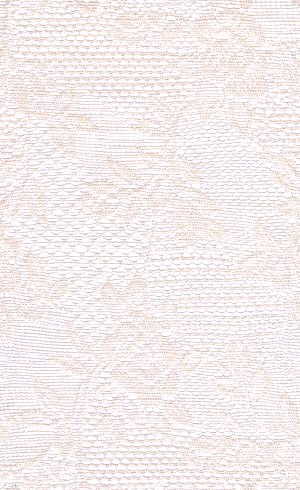 "Trompe - l'oeil" was used to considerable effect. The splendid woodwork included an organ case carved by Grinling Gibbons, and Handel would certainly have played on this organ. 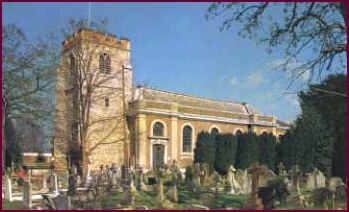 The Chandos Anthems would have been performed in this church, and it seems likely that the Duke, excited by the progression of the interior frescoes, would have called upon Handel to provide suitable music for church performance, for Handel began work almost immediately on the Chandos Anthems (HWV 245-56). Less than two months later, on September 25th Brydges wrote to Dr Arbuthnot, Court Physician and well known patron of the arts: Mr. Handle has made me two new anthems very noble ones & Most think they far exceed the two first. He is at work for 2 more and some Overtures to be plaid before the lesson. The first two to which James Brydges refers are O Sing unto the Lord a New Song (Anthem 4, HWV 249b) and As Pants the Hart (Anthem 6, HWV 251b). The second pair consisted of Let God arise (Anthem 11, HWV 256a) and My Song shall be alway (Anthem 7, HWV 252). The next pair (about which "he is at work") were probably Have mercy upon me (Anthem 3, HWV 248) and O be joyful in the Lord (Anthem 1, HWV 246). It is likely that In the Lord put I my trust (Anthem 2, HWV 247) and I will magnify Thee (Anthem 5, HWV 250c) were completed before that winter. Of the eleven in total, the remaining anthems were probably written during 1718. In certain respects the life-style of "Princely Chandos" was, as contemporaries recognized, as grand as that of a German electoral prince. In 1720 however, the year in which the rebuilding of the palace was completed, the almost miraculous rise in the fortunes of Chandos (as Brydges was styled from April 1717) crashed abruptly in what became known as the South Sea Bubble financial disaster. When the South Sea Company had been set up in 1711, it was granted a monopoly on trade with all Spanish territories, South America and the west coast of North America. In 1720, the government encouraged investors to trade government stocks for South Sea Company shares and as these boomed, more and more people speculated in them, forcing the share price higher. In much the same way as many internet stocks today, the price was "talked up" based on nebulous, largely unfounded future prospects, and the price of nominal �0 shares rose to almost �000. In July 1720, with company shares at a vastly inflated, unrealistic and unsustainable level, confidence collapsed, and with it the share price. Investors lost considerable amounts and some even committed suicide. Chandos himself suffered major losses, signaling the end of his princely lifestyle. Needless to say, Handel left to seek his fortune elsewhere. Chandos himself survived, though in greatly reduced circumstances. 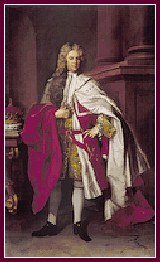 His wife Cassandra died in 1735, and a year later he married a 43 year-old widow (Lydia, Lady Davall) who revived the family fortunes by bringing with her a dowry estimated at around �,000. Chandos died in 1744, and his third wife Lydia died in 1750. The glories of Canons barely survived its creator's death in 1744. The Palace was demolished in 1747 after the second Duke had sold off the great house and its effects in order to pay the accumulated family debts. The materials were auctioned for architectural salvage: the original colonnade now stands in front of the National Gallery in Trafalgar Square, London, and the gates at New College, Oxford. The estate itself and the materials remaining on site were bought by William Hallett, a prosperous cabinet-maker turned gentleman, who built a country house (the 'old house' of what is now North London Collegiate School) on a relatively modest scale in 1760. The Canons church of St Lawrence however remains today, its frescoes fully restored. And the musical legacy of Handel at Canons is ours to enjoy. The Anthems themselves are founded on the choice of texts. Handel is known to have been very familiar with the Bible, and to have resented implications that texts should be provided for him. The texts are all based on Psalms, and while always preserving the spirit of the text, Handel will often combine two verses with a little judicious editing. Having selected the texts, the music is then composed to match their mood, much indeed as Bach did in his cantatas, resulting in a wide variety of musical mood and texture. The Anthems have an unusual scoring in common: three-part chorus supported by a three-part orchestra. Though records appear to show that the instrumentalists would have outnumbered the singers, as always with Handel it is the vocal parts which dominate. Noteworthy is the use of the oboe as a uniting thread of timbre, known to be one of Handel's favorite instruments. The writer is indebted to the Rector of St Lawrence Church, Fr Paul M Reece, for his church photo and descriptive detail of its interior.